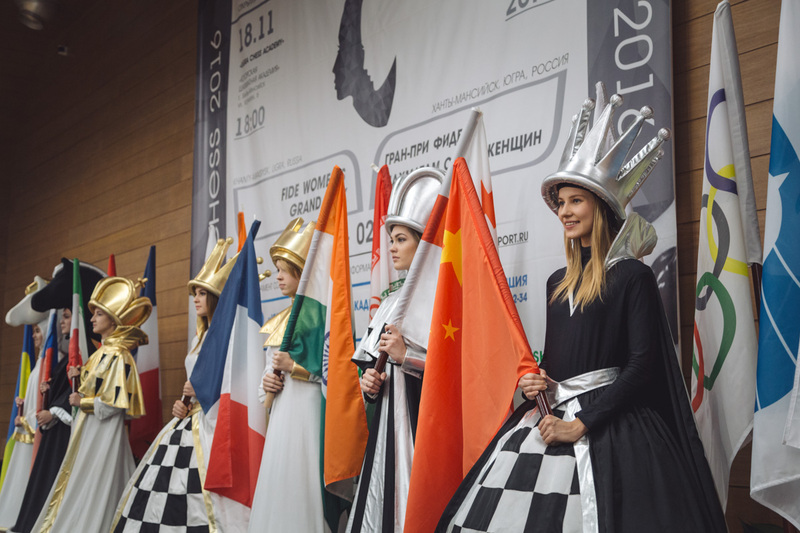 The concluding tournament of the FIDE Women’s Grand Prix 2015/16 started in Khanty-Mansiysk. 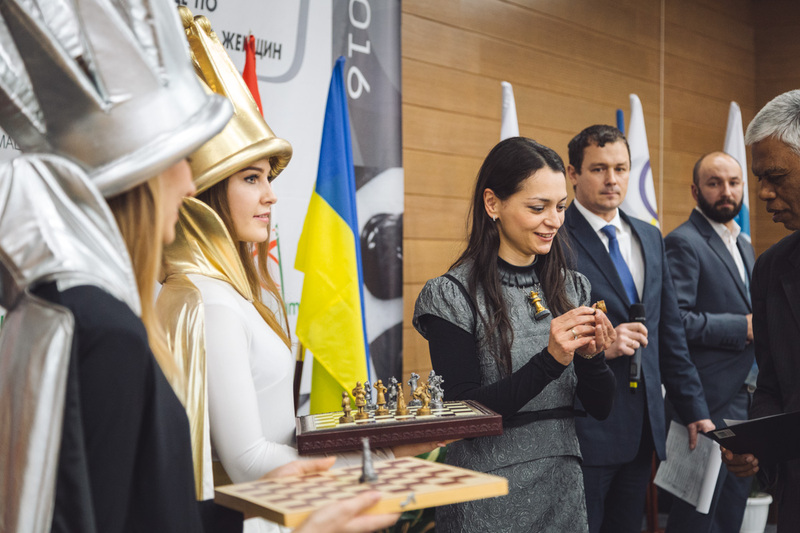 The event takes place at the Ugra Chess Academy, famous for its world class competitions, including Women’s World Blitz and Rapid Championships of 2013 and 2014, 2014 Candidates tournament, final leg of the FIDE Grand Prix 2014/15. These days the Academy once again gathered renowned grandmasters, FIDE representatives, regional officials, and young students of the Ugra Chess Academy, who make their first steps on the way to perfection in this mind game. The leaders of modern women’s chess arrived in the capital of Ugra from seven countries – China, Iran, Ukraine, India, France, Georgia, and Russia. A parade of the participating countries was organized in their honor. 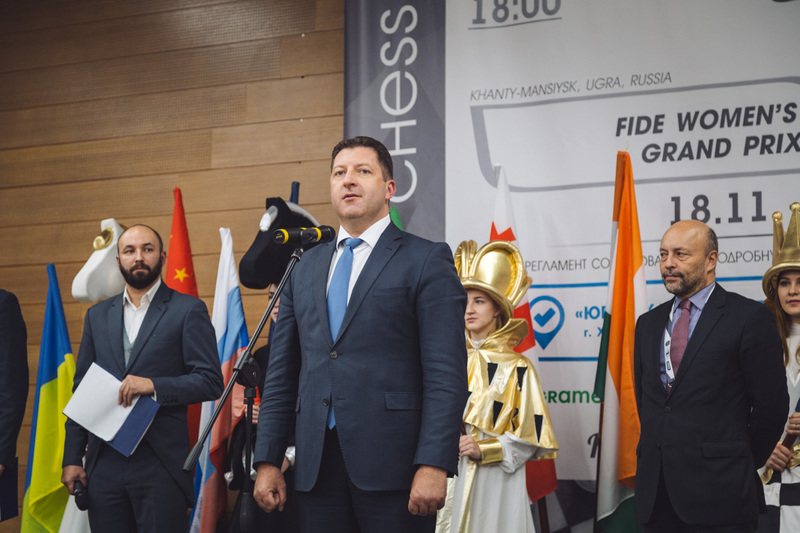 The opening ceremony of the tournament was attended by CEO of FIDE Geoffrey Borg and the director of the department of physical culture and sports of Ugra Igor Gubkin. Mr Gubkin was the first to address to the tournament participants. He congratulated the players on staring the event and wished them success. “Once again Khanty-Mansiysk welcomes an international chess tournament. We are thankful to FIDE for having a pleasure of organizing this event. I assure you that we prepared well and will carry out this tournament at the highest level of organization”, – added the director of the sports department. “I would like to thank the governor of Ugra Natalia Komarova, the president of Ugra Chess Federation Vasily Filipenko, “UgraMegaSport” and Igor Gubkin and, of course, our chess friends and dear chess players. I am very happy to be here again. Just last month I was here for the World Youth Championships. And as our good friend said Khanty-Mansiysk is actually today probably the leading chess city in the world. This morning I made a small exercise and counted at least 11 times that we were here in Khanty-Mansiysk for major chess events. I was a bit surprised today to know that 2 players haven’t been here before, because out of 12 players 10 have been here for some tournaments in the past. So we welcome you to show them your hospitality. Many players have been here for several events and have pleasant memories of them. This event is very important because it will determine the overall winner of the Women’s Grand Prix Series. We have the additional pleasure, of course, that women are playing fighting chess so there will be very interesting games. And it will be balanced by the generous hospitality of the host city”, – said Geoffrey Borg. 1. Valentina Gunina, 2. Almira Skripchenko, 3. Sarasadat Khademalsharieh, 4. Nino Batsiashvili, 5. Natalia Pogonina, 6. Natalia Zhukova, 7. Ju Wenjun, 8. Olga Girya, 9. Bela Khotenashvili, 10. Harika Dronavalli, 11. Alexandra Kosteniuk, 12. Lela Javakhishvili. 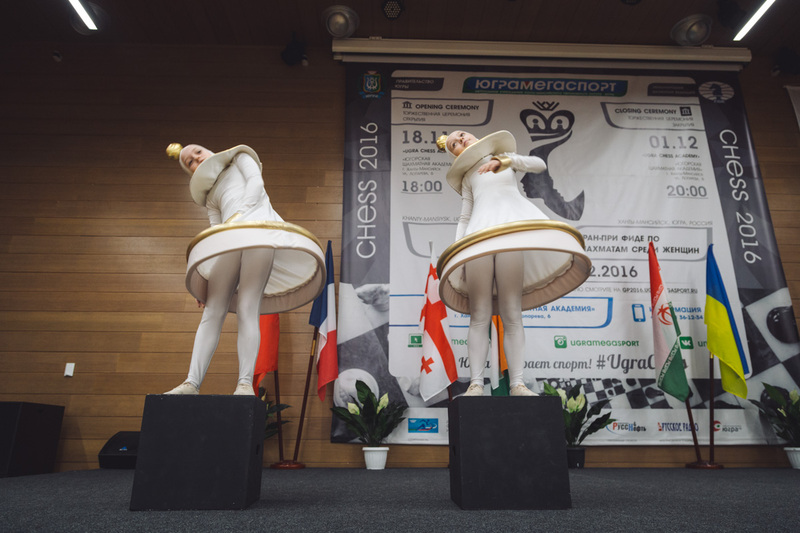 The finale of the opening ceremony saw the dance routine of the Dance Academy – Children Theater of Modern Dance, dedicated to chess. 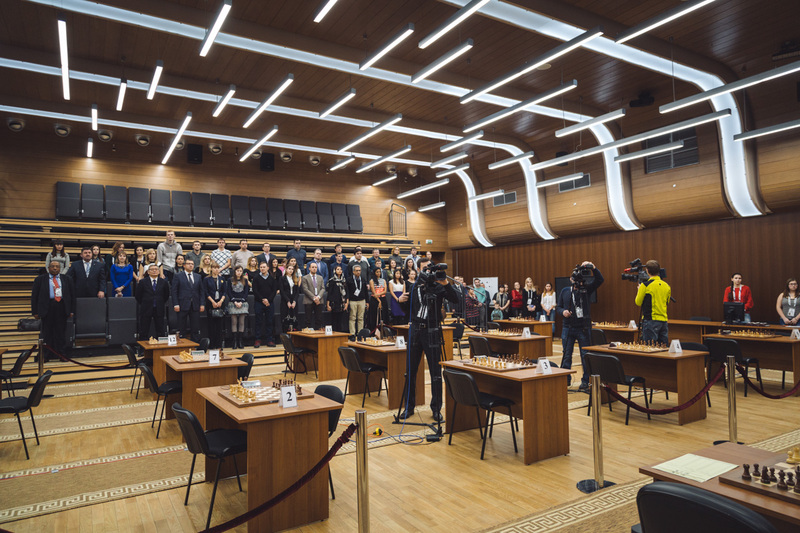 We would like to remind you that the concluding leg of the FIDE Women’s Grand Prix is a second major chess tournament organized in Khanty-Mansiysk this year. In October the capital of Ugra hosted the FIDE Youth Championships Under 14, 16, and 18. 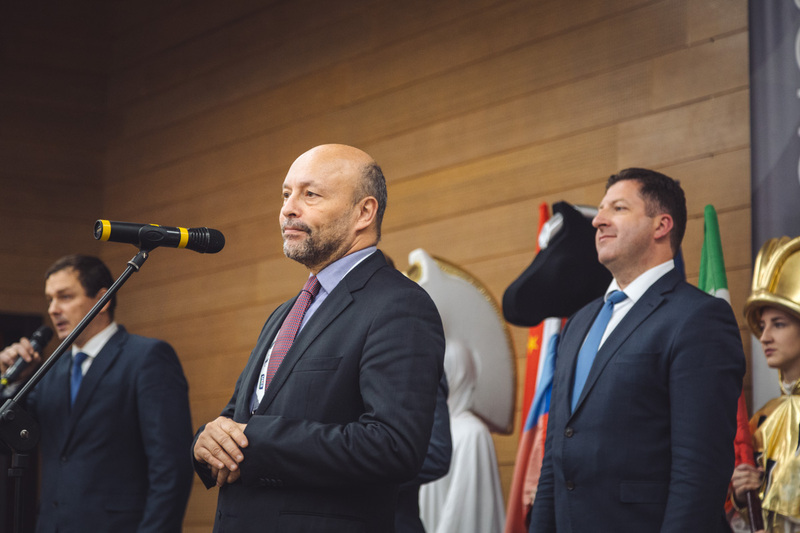 In the near future Khanty-Mansiysk will host a number of top events, including the 2020 World Chess Olympiad. This will be a second Olympiad for our city, which organized the main team chess event of the calendar in 2010.